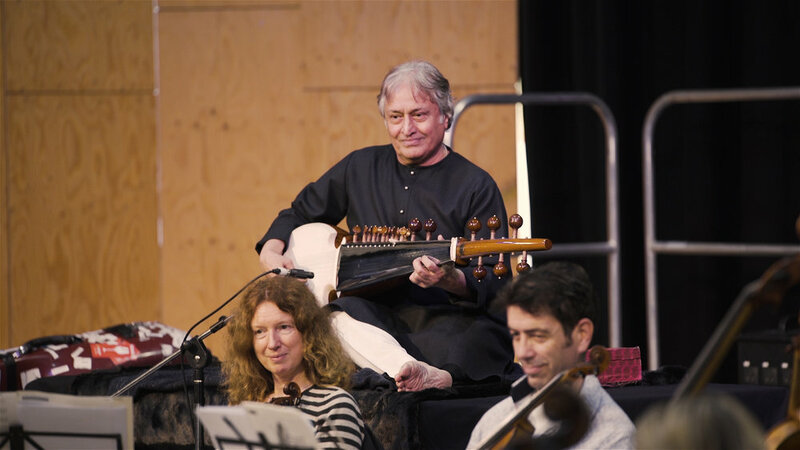 Sinfonia Verdi's Artistic Director David Murphy has collaborated with Amjad Ali Khan for over 10 years, creating new works that bring together western and Indian classical traditions in fresh and vibrant ways. A long-time fan of European classical music, working with David Murphy and Sinfonia Verdi has enabled Amjad Ali Khan to fulfil his dream of composing works for sarod and orchestra. Roots of Fire was created in 2017 including musical material produced by children aged 10-11 in a large-scale series of school workshops across Luton, Slough and Leicester in the UK, generously supported by the Bagri Foundation. The 40-minute work can now be performed by Sinfonia Verdi combined with other orchestral works which complement and inspired the Roots of Fire creation.